My garden is so abundant with raspberries that I am inspired to get creative in my kitchen. After developing several recipes this is my favourite. This is great with a salad made of romaine, arugula, grated carrots, radishes and red onion. 1. Blend the ingredients in a blender. 2. 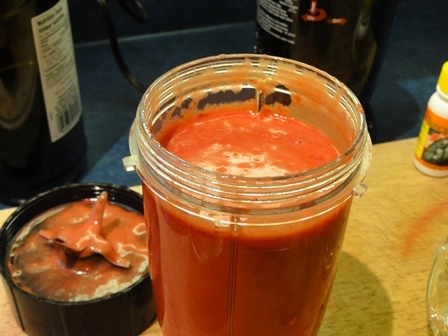 Pour into a salad dressing bottle or glass jar. 3. Refrigerate; will last from 2 to 3 weeks. Recipe Tip: Raspberries are tart even when they are very ripe; so you may find that you want to add less lemon juice. Raspberry Salad Dressing finished and bottled for use. Sugarless Apple-Raspberry Jam – A delicious and sugarless jam. Green Raspberry Smoothie/Pudding – It’s a healthy smoothie. Its a tasty pudding! No… It’s WHATEVER YOU LIKE! Make Your Own Olive Oil Lemon Juice Salad Dressing– This is a simple salad dressing base recipe that you can make up different each time with a variety of herbs or types of salty flavours. Balsamic Salad Dressing – Occasionally I make this balsamic salad dressing. I still put lemon juice in it as I do not want too much of the acid vinegar which I just use to add flavour. I always get organic balsamic vinegar. Goes well to with blueberries or gooseberries( we use those a lot in Germany. Oh, I love this idea and will try tonight! I can’t do any vinegar, not even Bragg’s Apple Cider, because of my acid reflux. This recipe is created just for me!! 🙂 Thank you! Caterina, happy this works so well for you! I understand what you are saying as I had that for years which led me to developing stomach friendly recipes.